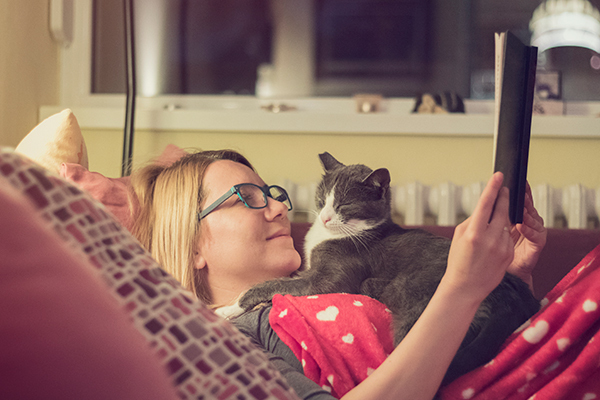 Next on The Scoop: Do Cats Experience Separation Anxiety? 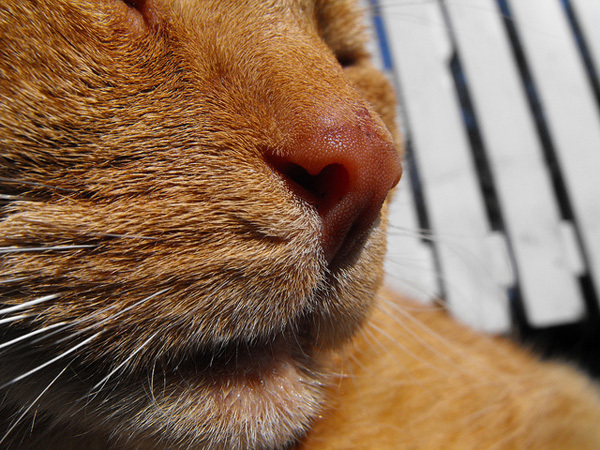 Do You Kiss Your Cat on the Lips? Um, I Do! I’ve always kissed my cats on the little kitty lips. In fact, I’ve never even thought twice about it. I’ve found the whole kissing-on-the-lips business is quite a divisive topic among cat lovers. And those on both sides feel quite passionately about their stance on the subject. 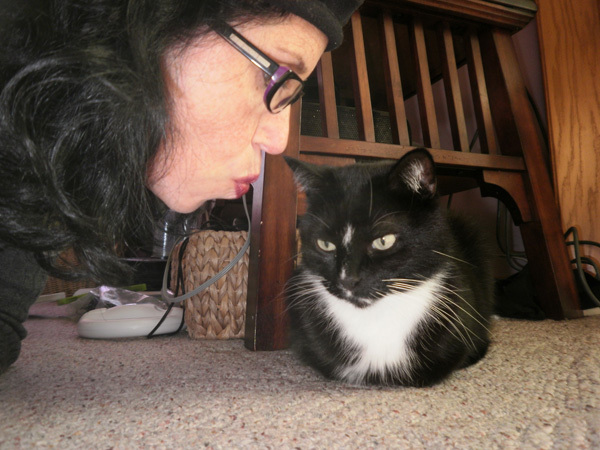 When I admit to being a lip-kisser, those in the other camp usually respond with something like, “Ewww … I know where those lips have been” or “Do you know they lick their butts with that mouth?” Of course I know that — it’s not my first cat rodeo. I guess it truly doesn’t bother me. I’ve never been a germaphobe and rarely get a cold. Even as a child, I never avoided playing with sick friends and I always kissed cats — and the occasional dog — square on the kissers. I am aware that some “experts” say that kissing cats and dogs on the mouth can make you susceptible to disease. Even the almighty Dr. Oz warns against it. I don’t think Dr. Oz has seen my Phoebe’s lips. They’re pink with little spots of black and they’re totally irresistible. Plus, I don’t know how much I trust a guy who always wears scrubs. Seriously — has anyone seen him in regular clothing? 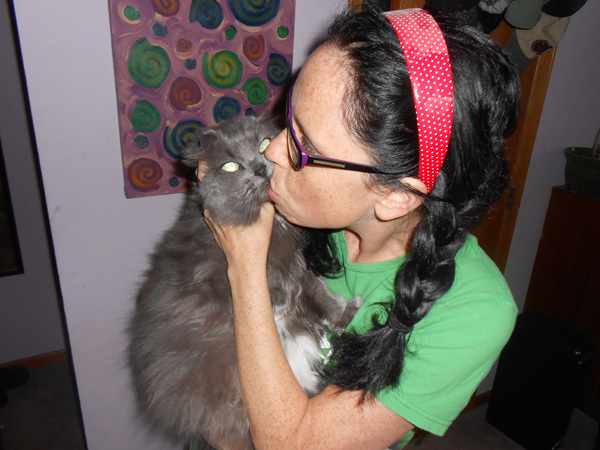 I’ve found that some people get completely freaked about kissing cats. 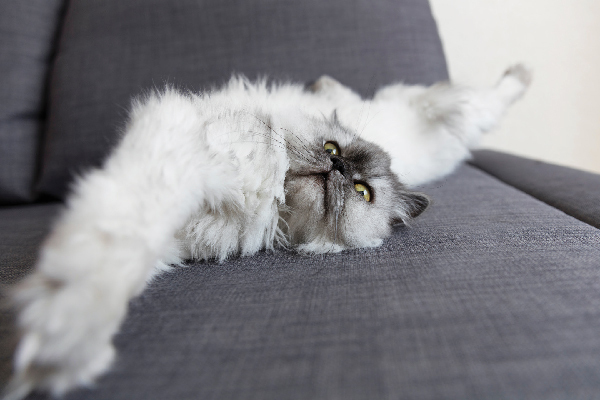 In a cat-kissing forum (yes, I happened across such a thing), one reader was nervous because she thought that kissing her cat’s belly fur would result in the introduction of some parasite into her lungs, causing her lungs to explode. In other news, teenage girls can get pregnant by tongue-kissing their boyfriends. 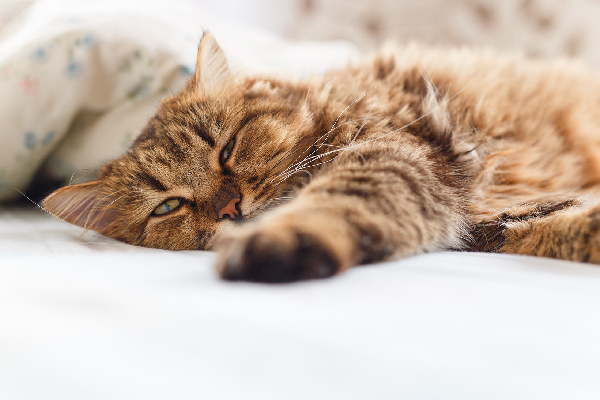 I honestly don’t mean to be facetious (much), but really … if burying my face in my cat’s stomach meant my lungs would explode, then 1) My cat-huffing mellow would be completely harshed and, 2) My lungs would have exploded by about age three. I’d be sitting here writing this and breathing by magic. 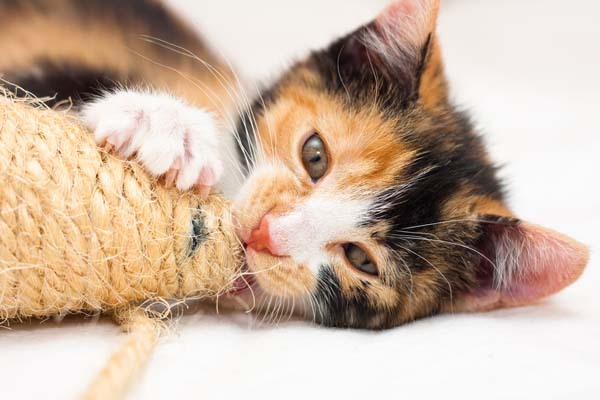 Some non-scrubs-wearing “experts” say that cats’ and dogs’ mouths are actually cleaner than ours, and that kissing a pet is probably cleaner than kissing a romantic partner. How about that? I’ve never seen my husband tongue-clean his own bottom, but I have seen him eat some nasty liver sausage and pickled eggs. I’m pretty sure there are some parasites living in that stuff. There are all kinds of studies about hugging and other forms of affection causing the body to release endorphins. 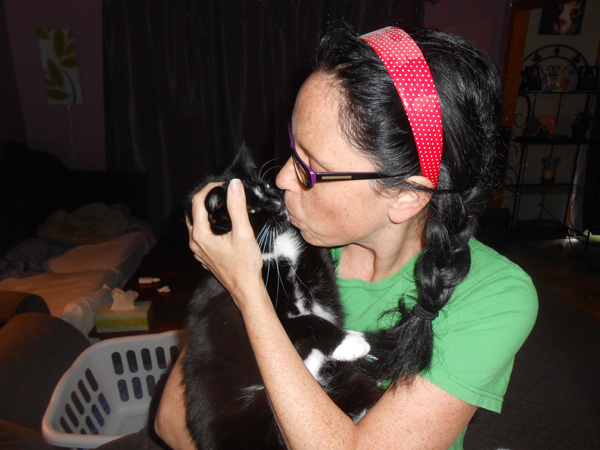 When I smooch my kitties on the lips, I feel extra-close to them — closer than when I kiss the the tops of their heads or back haunches. I think I must release an additional 13 to 20 endorphins with each kiss. I don’t wear scrubs or anything, but I’m fairly certain my science is legit. I like the smell of my cats’ breath. Weird? Maybe, but for whatever reason it appeals to me. Lip-kissing brings me closer to the sweet smell. It’s way better than liver sausage and pickled eggs, that’s for sure. In fact, it’s kind of like aromatherapy. My cat’s breath smells better than a Yankee Candle. Cats’ eyes are so beautifully expressive and I get an up close and personal look at those peepers when I’m going in for a smack on the mouth. Sometimes the eyes tell me kitty is serene and completely in love with me. You know that look, right? Makes my heart melt every time. And I’m certain I release a dozen more endorphins when that happens — a full baker’s dozen if he’s also purring. Sometimes kitty’s eyes tell me to kiss him quickly and go away. Familiar with that look? Many times it goes hand in hand with an angry snuggle. 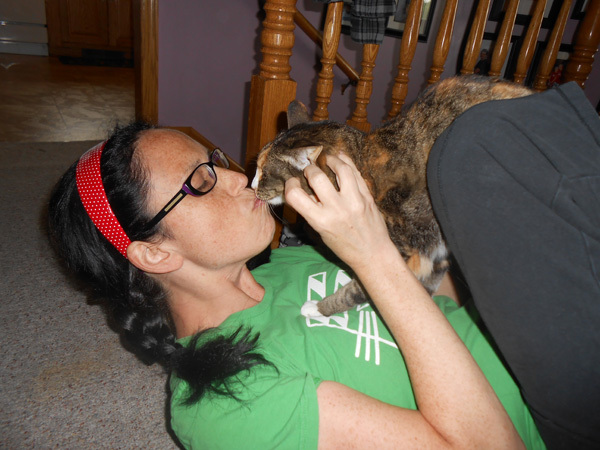 As you can see, I’ve presented a fairly strong argument for the joys and benefits of mouth-kissing a cat. Try it just once. I’m not here to tell you to toss out the little bottle of antibacterial gel that’s clipped to your keychain. And continue watching Dr. Oz and his ever-present scubs! Please! I hear he has a fabulous recipe for a colon cleanse. Do you kiss your cat on the lips? Tell us about it in the comments!